Roslindale Village Main Street reports that Shaking Seafood, on Poplar Street in Roslindale Square, where Jersualem Trading used to be, has its "soft" opening at 3 p.m. on Thursday. The seafood place specializes in a Cajun style of cooking in which you pick your seafood and your spices, then they cook and shake them for you and you dig in. Workers were busy inside the former Jerusalem Trading on Poplar Street in Roslindale Square yesterday, doing the work required to turn the old home-furnishings stuff store into a restaurant that will serve Cajun seafood in a bag - after resolving whatever ISD issues had stopped work there for several months. Read more. A developer has proposed a series of seafood buildings in the Raymond Flynn Marine Park that would include Boston's first public seafood market as well as new space for seafood processors. Read more. The Boston Licensing Board next week considers a request for food-serving and liquor licenses from Shaking Seafood, which hopes to open on Poplar Street in Roslindale Square, where Jerusalem Trading used to be. Read more. Roslindale Village Main Street reports Shaking Seafood, "a New Orleans Cajun-style seafood restaurant," will replace the large ceramic tiger and elephant statues of Jerusalem Trading on Poplar Street. Read more. Boston Restaurant Talk reports East Ocean City on Beach Street has ceased to be. The Board of Appeal today approved plans to replace an old pet-care place at the lonely corner of Tremont and Herald streets with a new seafood place that would offer outdoor seating in warmer months. Read more. Stop by Batter'd & Fried Boston Seafood House, 1008 Woodland St. in East Nashville, where the walls are lined with photos of Sox players and the dishes include New England fish and chips, Boston clam chowder, Atlantic whole belly clams and Boston Cream Pie. Sam Adams is on tap, of course, and when the Sox are playing, their games are on the TVs. Read more. The Lynn Item reports a developer wants to decommission the nautical restaurant and turn the space into retail space and a new, un-masted restaurant. 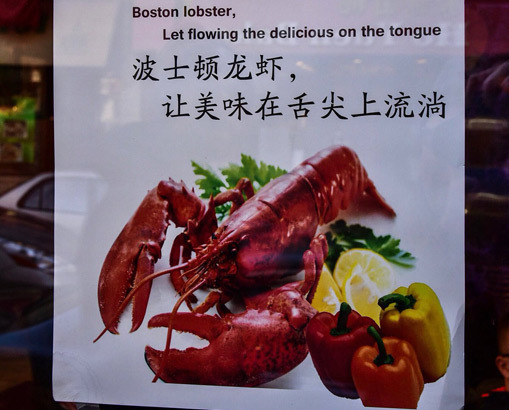 JB Parrett noticed this poetic ad for seafood the other day at one restaurant in Chinatown. Brad Kelly, though, noticed a more sinister crab at East Ocean City: "Dinner is daring you to come in:" Read more. Brian Sniffen is looking for American eel, not unagi. NorthEndWaterfront.com reports that Neptune Oyster on Salem Street could soon get competition from a new oyster place across the street whose lawyer describes it as "maybe a Neptune Oyster on steroids." Die-hard Sullivan's fans were out in force this morning for the re-opening of the Castle Island institution. 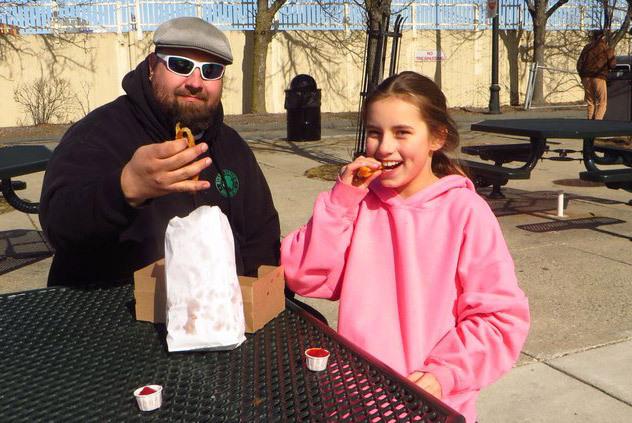 Eileen Murphy captured Matt Noonan and Charlotte Donovan of Quincy enjoying their first outdoor hot meal this year at Castle island. For the fifth straight year, John Connors was first in line. The Boston Licensing Board today found "no violation" in the case of a guy who leaped into Boston Harbor from the roof deck of Legal Harborside on Northern Avenue. Read more. Dot Rat explains why that would be one of the appetizers at Jake's Seafood in Hull. Sean Griffing, who co-owns Trade on Atlantic Avenue, is seeking city approval to open a new, high-end seafood place on Ring Road in the Prudential Center complex. Read more. CORRECTED: Application is only for LTK patio. Legal Test Kitchen, 225 Northern Ave., goes before the Boston Licensing Board next week to seek permission to keep its outdoor patio open until 2 a.m. The restaurant currently has to shut it at 11 p.m. Monday through Saturday, and 10 p.m. on Sunday. Legal Harborside, 270 Northern Ave., meanwhile, hopes to gain permission to keep its patio open until 2 a.m. seven days a week. The board considers the requests on Wednesday in its eighth-floor hearing room in City Hall. Hearings start at 10 a.m.
Luke's Lobster, which runs lobster-roll places in Manhattan and Brooklyn, is poised to open its first Boston outlet, at 77 Exeter St. Read more. Boston Restaurant Talk reports McCormick & Schmick has shut down.